Greening of a neighbourhood with these green art pieces can help the neighbourhood reduce crime rates and feel safe and included, in return, helping to reach the Healthy City Strategy (HCS) of being and feeling safe and included, as well as attributing to the HCS of expressing ourselves with increased public participation and community engagement in arts and culture. 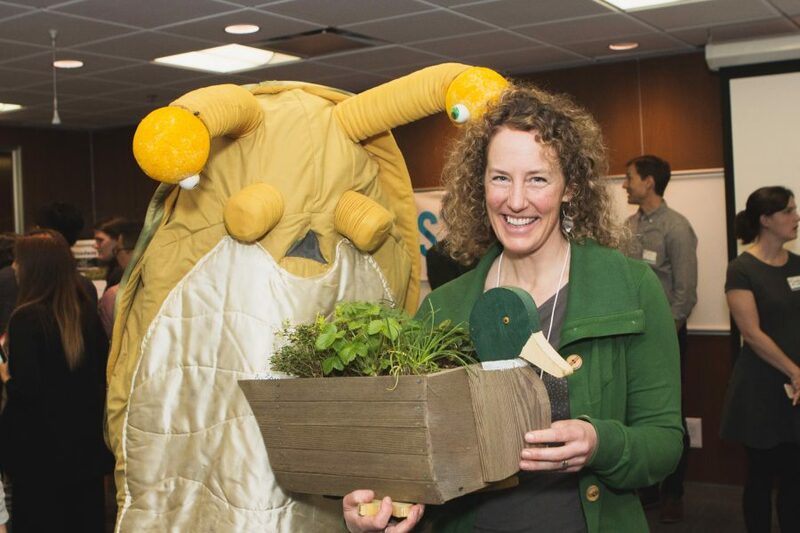 Furthermore, the added biodiversity of sustainable vegetation implemented in the vertical garden will eliminate airborne toxins and generate better air quality in the nearby surroundings to help with the HCS goal to provide a healthy and livable environment for Vancouverites to thrive in. (Timur 600). Additional biodiversity also aligns with the Greenest City Action Plan goals of Access to Nature and Clean air. Furthermore, the repurposing of Pallets otherwise headed to the landfill helps contribute to The Greenest City Action Plan. Many wooden pallets are being thrown away instead of being repurposed in Vancouver. Therefore, in an effort to be more sustainable, wood pallets will be the upcycled host for the vertical garden vegetation. Most of the Skytrain stations have columns with blind surfaces and receive adequate solar radiation. 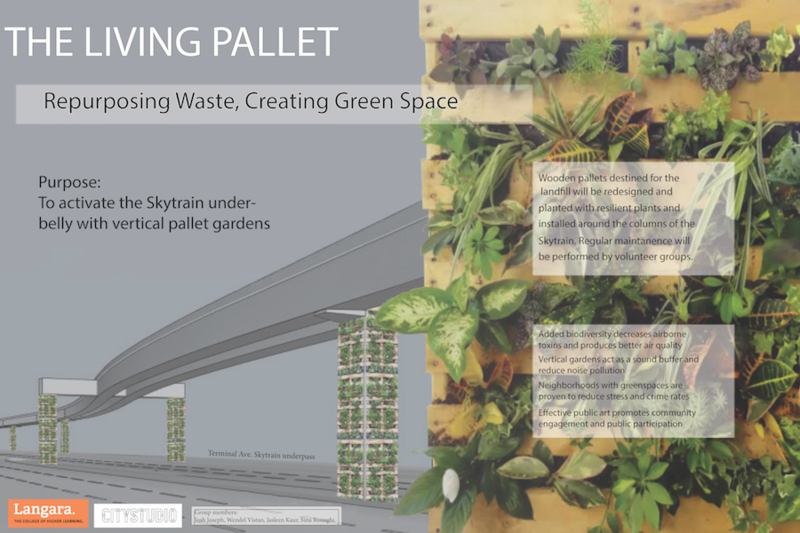 For these reasons and the context of the location, a vertical pallet garden surrounding one or more columns of the Skytrain underbelly is proposed as a permanent display using a frame around the columns for installation to minimize contact with the columns. This could significantly upgrade the public perception of the barren underbelly of the Terminal Skytrain with the addition of the public art pieces while addressing the goals of The City of Vancouver. 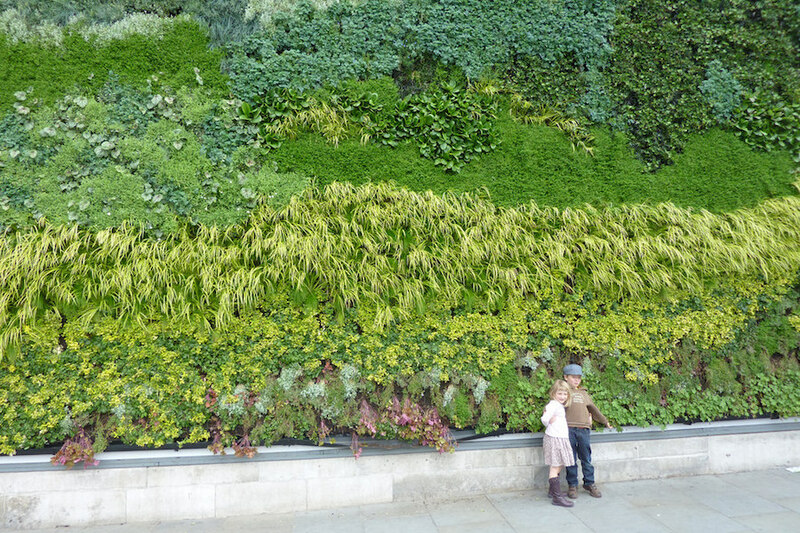 Furthermore, a living wall can act as a location staple to attract people to the area which can be beneficial to nearby businesses.